This is an experimental project to explore spatial concept that can serve multiple function simultaneously and using the attribute of space to guide different groups of users. The site was a community market at the hotspot of parkour fans. 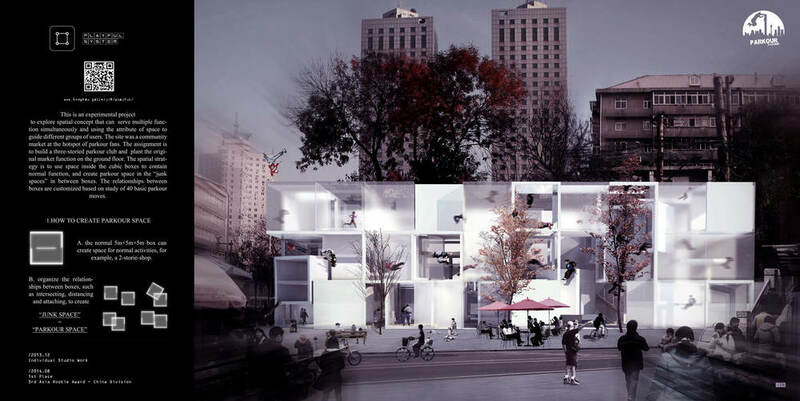 The assignment is to build a three-storied parkour club and plant the original market function on the ground floor. The spatial strategy is to use space inside the cubic boxes to contain normal function, and create parkour space in the “junk spaces” in between boxes. The relationships between boxes are customized based on study of 40 basic parkour moves.